In what’s being dubbed the “Data Election,” CNN’s Political Prediction Market continues to capture the public’s outlook into the probabilities surrounding the races and issues that matter most. And with results so fascinating, CNN and Pivit are upping the ante. During the month of December, all registered players of “The CNN Politics Debate Sweepstakes” will have the opportunity to enter to win a trip for two to attend the March CNN Republican Debate in person in the studio audience. The winner will be determined by the standings of the national leaderboard, which tallies all the points players win for correct predictions across all markets. 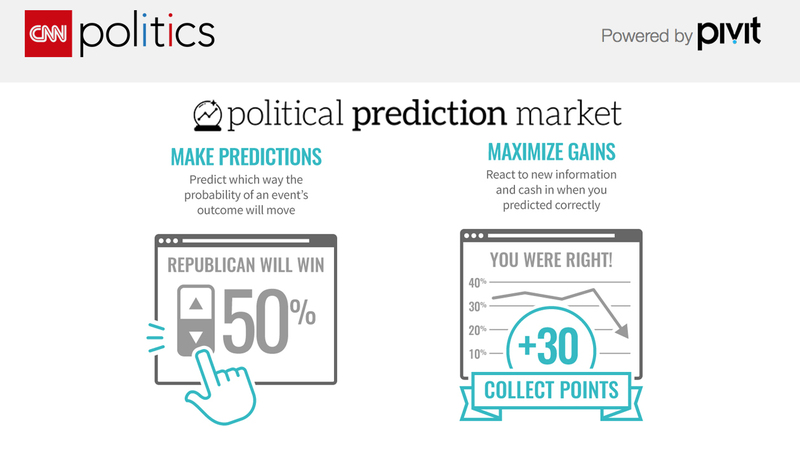 CNN’s Political Prediction Market, administered by Pivit, allows the public the chance to predict where the public’s perception of the election will go based on analysis, polling and user intuition. The markets change as the public weighs in on the increasing or decreasing chance that a candidate or party wins or loses a debate, primary and the overall election. Users have a chance to prove their knowledge against family, friends, and others all across the world by participating in this exciting political game that’s available to play for free at CNN.com/play. Visit CNN.com/play to enter and have a chance to win. For official rules and regulations, visit CNN.com/play.